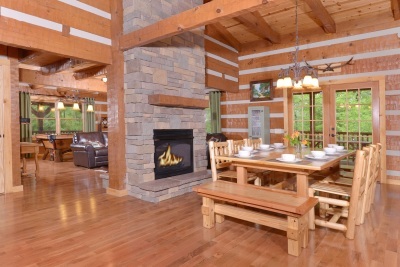 Classic hand-hewn hemlock log cabin near Gatlinburg Arts and Crafts Community, Smoky Mountains. 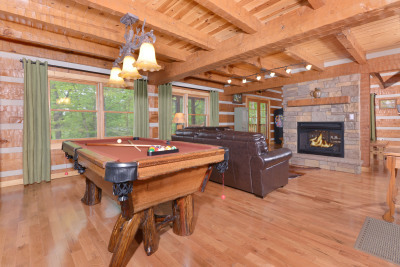 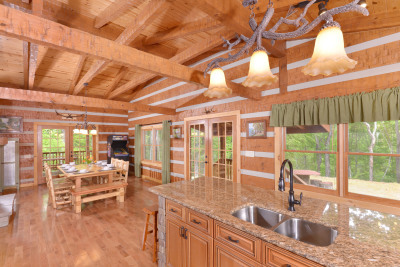 On several wooded acres of privacy, seclusion and Smokies nature surroundings. 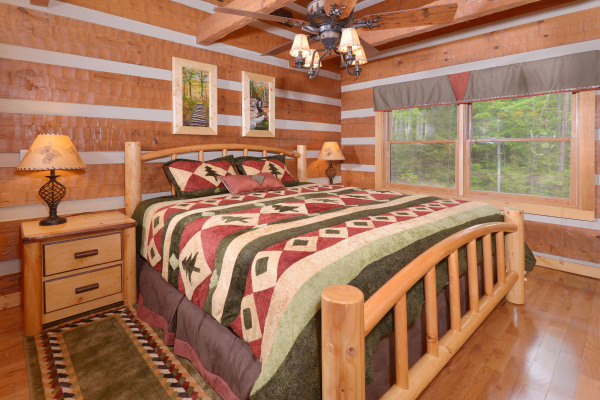 Sleeps 10 guests. 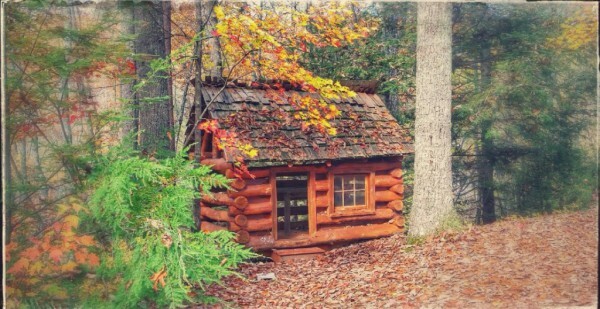 No service fees. 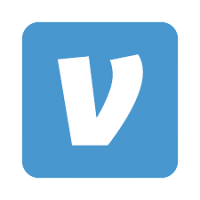 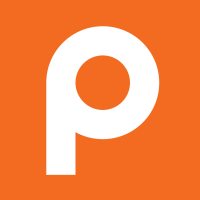 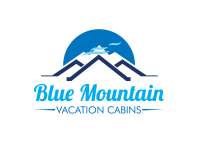 Book direct today. 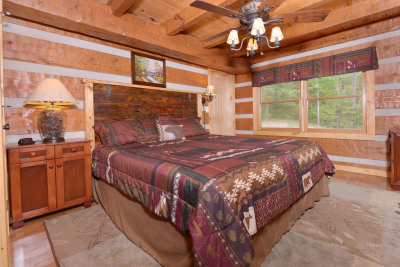 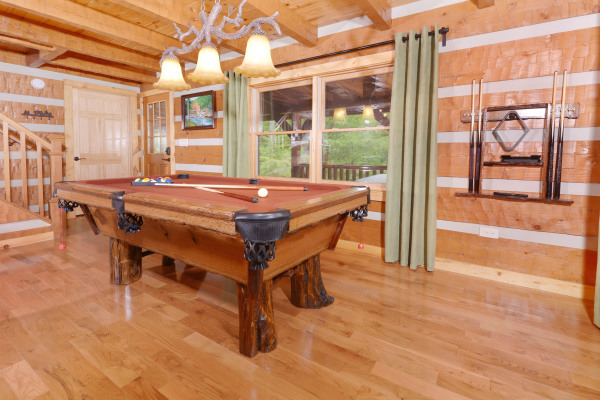 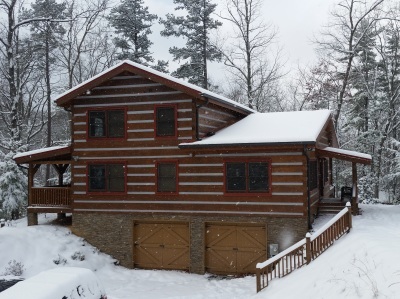 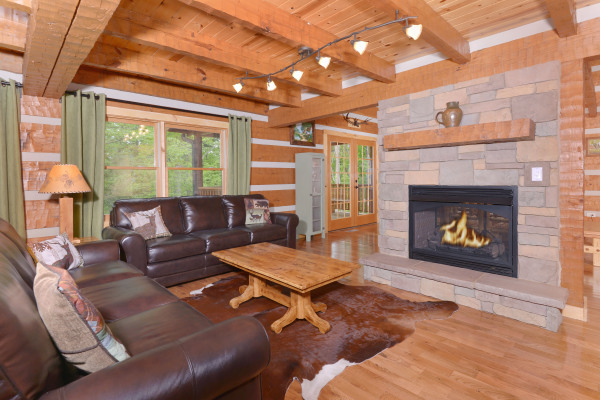 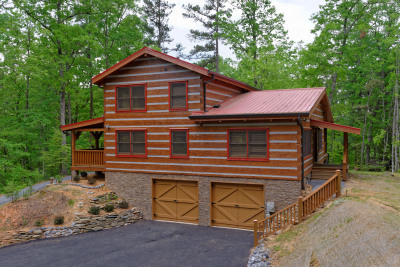 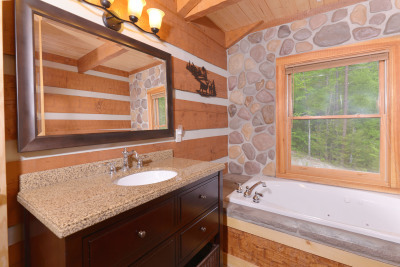 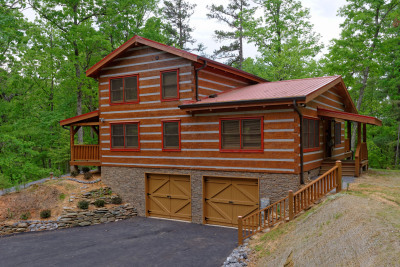 Situated close to the Arts and Crafts Community, between Gatlinburg and Pigeon Forge, Appalachian Escape log cabin sits on ample property with a peaceful wooded view. Floor to ceiling, two-sided stone-clad fireplace invites you in to snuggle into one of the comfy leather couches. 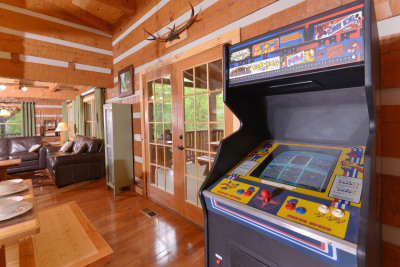 Watch a movie on a 48-in HDTV, play a game of pool on a rustic log pool table, or one of the 48 classic 80s games on the upright arcade machine. 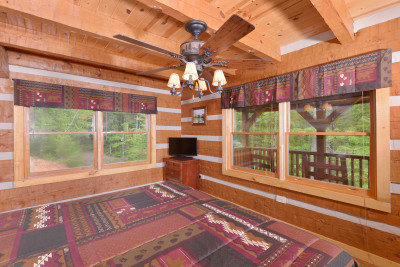 All-log interior is accented by designer pine cone motif light fixtures. Modern well equipped kitchen with tall soft-close cabinetry and stainless steel appliances, custom chiseled-edge granite counter-tops and a huge island will delight any cook. 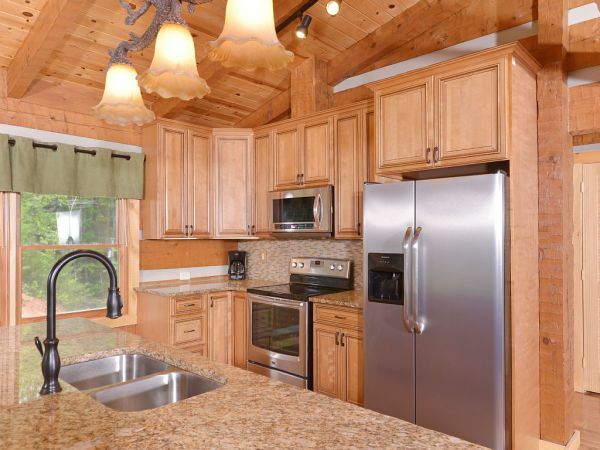 You can create your meal and entertain at the same time because this luxurious and functional kitchen flows nicely into the spacious dining area. 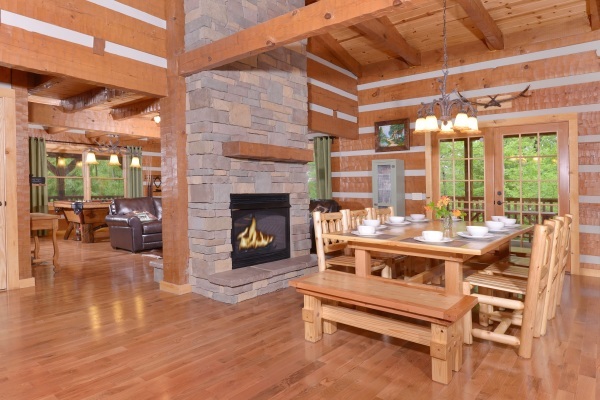 Generously sized farm-style dining table seats 10 guests, and the expansive kitchen island seats 6, giving you and everyone else in your group plenty of room to mingle or to enjoy quiet meals together. 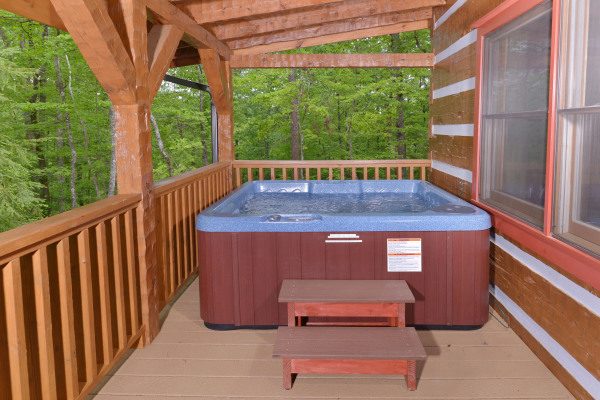 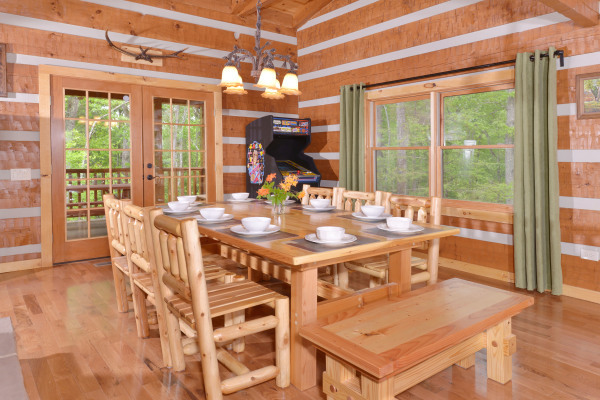 Set on several acres, Appalachian Escape log cabin provides its guests with the privacy while still being close to all the area attractions. 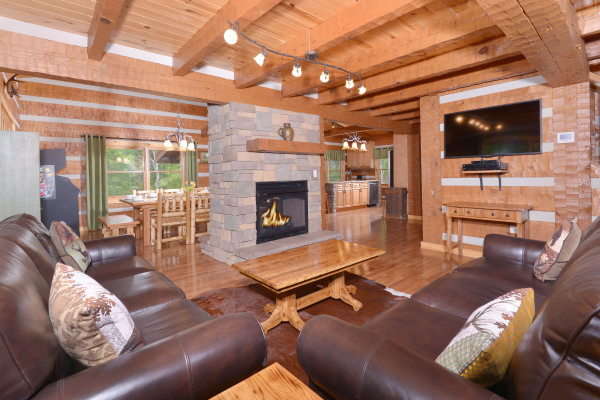 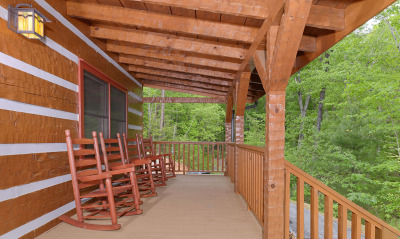 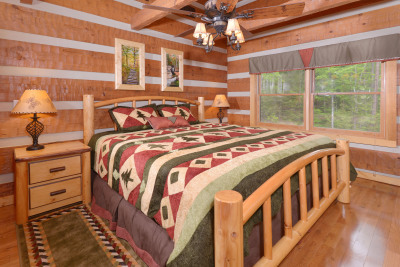 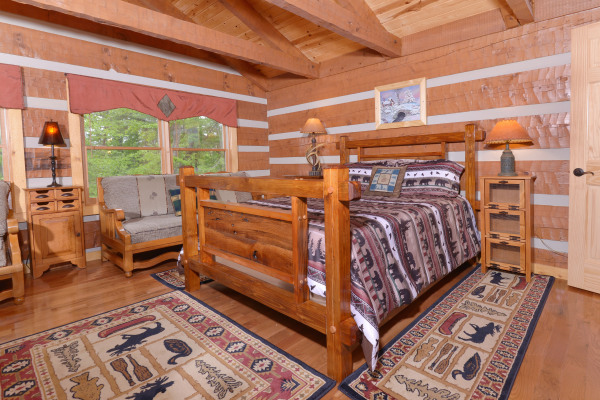 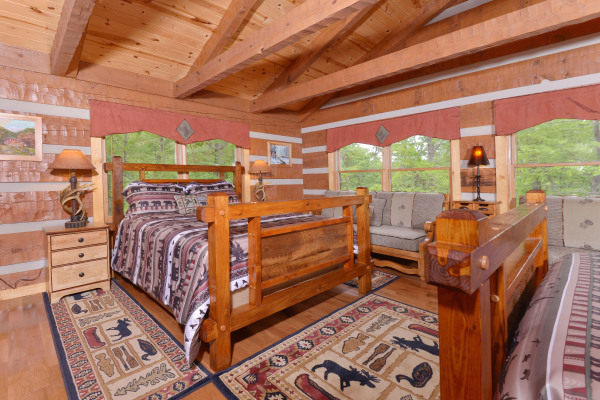 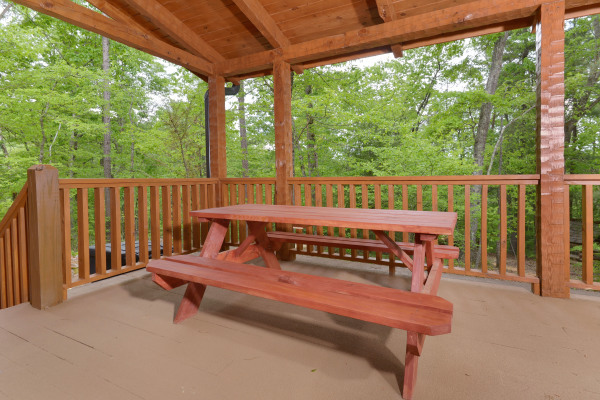 Take in the quiet of the Smoky Mountains with wooded and seasonal mountain ridge views outside. 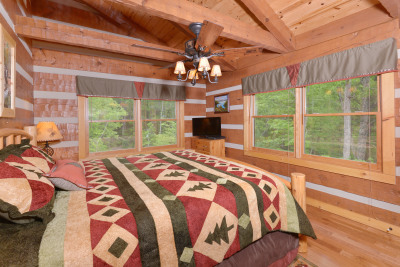 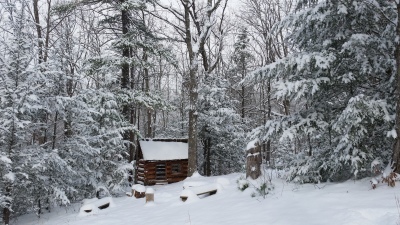 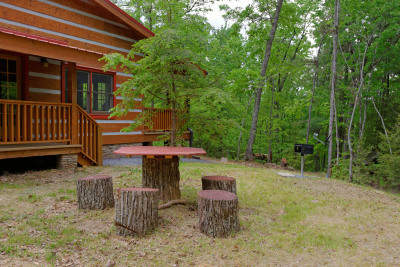 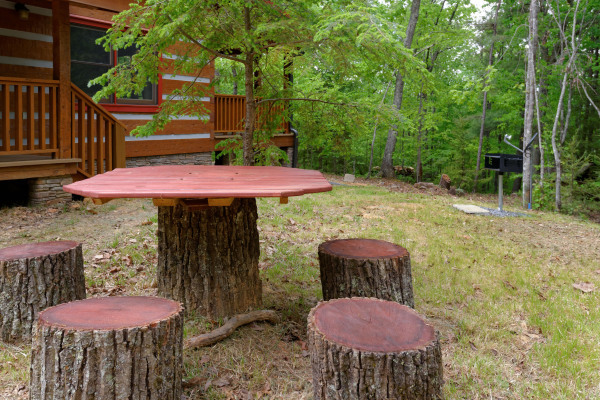 With a variety of native plants and trees growing in the cabin's own backyard, you will feel like you are already in the Smoky Mountains national park. 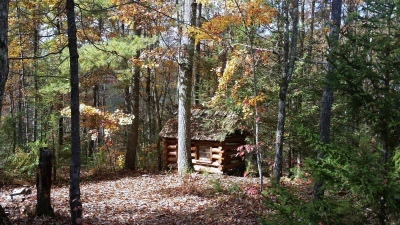 In spring, you can see flame azaleas and Pink Lady Slippers bloom, followed by rhododendrons in the summer. Rock away the hours in one of the rocking chairs on the full-length, covered porch. Have a relaxing dinner on the covered porch or gather around picnic table and charcoal grill in the yard. 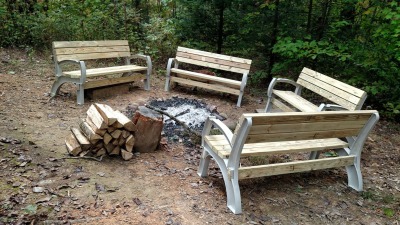 Roast marshmallows and make s 'mores by the back yard fire pit. After a full day of fun, soak in the 5-person hot tub. 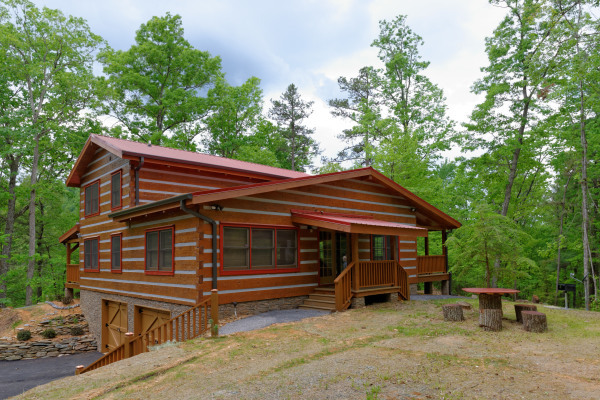 The expansive, relatively flat yard has enough room to play, and kids will love the "little log cabin" playhouse, built from trees harvested on the property. 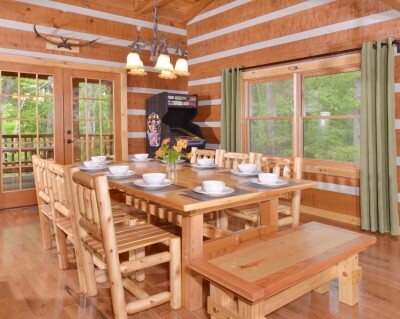 So, whether your idea of a dream vacation is to 'hide away' with family and friends, or to enjoy the many area activities & sites, escape to Appalachian Escape and find it all!